This is a very easy dish to prepare and really yummy to eat! But the way I made this makes me want to name this - Comedy of errors! A lot of things I did to make this was wrong. I did not have the proper batter to make this as required. I forgot to soak and grind a specific Kuzhi Paniyaram batter! But I did have Dosa batter and a Kuzhi paniyaram pan! I googled to see if I could use Dosa batter for this - someone out there had mentioned that her mom used to add rice flour to dosa batter and deep fry that and make similar paniyarams. So, I thought I'll try that - and instead of frying, I would just use my pan. So, I went into my pantry and picked my rice flour dabba..I added about 1 cup to about 2-3 cups of dosa batter. And after I mixed the batter, I noticed that I had picked the wrong dabba!! It was maida instead of Rice flour! There you go..messed up again. But anyways, I cut some onions, green chillies, curry leaves into small pieces. I was going to saute them before I add it to the batter. Right at that moment, I got a phone call and started talking ...once I hung up, my daughter wanted me to give her oranges that minute..!! I did all that and then turned to my batter. I added the cut onions and green chillies right into the batter. Oops..i forgot to saute them before I added it to the batter. Oh Crap! what else can go wrong.. Anyways..I heated up my paniyaram pan and added the batter to it. Then, when the bottom was nicely cooked, I turned them in the pan using a pair of skewers I had. They looked good when I did that. I just hoped they tasted good. 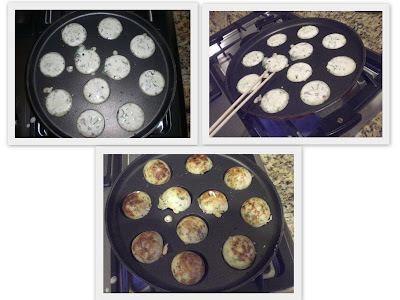 When all my paniyarams were done, I took them out of the pan. I waited a minute for it to cool down and then tasted one - ...hmmmm...it was yummy!!!!!!! Yay!! All's well that ends well! And I had planned to do peanut chutney as a side dish for this..I called my friend Kamakshi for the recipe as she makes it often. She gave me a quick recipe and that turned out well too. Thank You Kamkshi!! So if you have a lot of dosa batter and want a new recipe to use that - this is pretty good. You could add rice flour or maida or a mix of both to it and try this. Its easy, quick, not too much oil and hence relatively healthy. Now, you do need a special pan for this - but if you don't have one - maybe you can try it in a egg poacher pan - if you have one of those. I saw a similar pan once in a Danish store - I guess they make their own versions of these too!! As per my menu plan, I'm supposed to make Eggplant Panini. I'm almost thought of scraping it. Looked at the recipe, I needed Basil pesto..and then I did not have a panini maker or a grill with grooves..How can I make a panini without either of these? But I did have the eggplant, red bell pepper and zucchini and mozzarella cheese singles..I was not going to waste them. So I got started. The recipe for Basil Pesto called for fresh basil and pine nuts. I did not have either of them. But I did have dried basil, and almonds and green chutney at home made with cilantro and mint. So, with my imagination and desire behind me, I got working..
Green chutney - had at home - Thanks to Deepi - she had bought this for me last time when we had our party. This is one of the best green chutney's ever - made with cilantro and mint. I will get her recipe later and post it as a separate post. Dried Basil seasoning from the bottle. Blend them all together in a blender. Don't crush the almonds all together...its nice to taste crunchy pieces in between when eating. The spread is now ready. 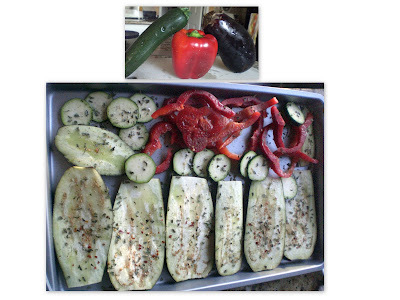 Main veggies - eggplant, red bell pepper, red onions and zucchini. Slice up the veggies into big slices. Arrange them in an oven sheet. Sprinkle salt, dried herbs, red chilli flakes, pepper on top of the veggies. Bake them in a 350 deg pre heated oven for about 15 mins. The veggies are nicely done by now. Take them out of the oven, arrange some mozzarella chesse slices on top of them and return to the oven for another 10 mins. 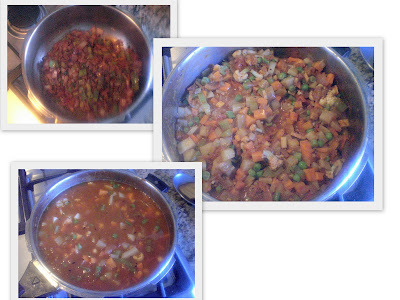 Check out the before and after pics of the veggies..haha! Now grill or toast the bread. I had some fresh bread from Panera - country bread. You could use whole wheat or white or any other variety you like. Slice up big pieces of the bread. Now, spread the wonderful fake pesto paste we prepared. Arrange the veggies on top of the bread and top it off with another piece of bread. Tada - Eggplant and veggie sandwich. If you do have a panini maker or a grill, just place this thing there wait for it to decorate the outside of the bread with stripes..you got your panini! But, like a wise man once said - who cares about the outer look? Its what's inside that counts! And trust me - this tasted wonderful. It did have a little bit of Indian feel rather than the italian feel because of the green chutney - but it was awesome! So I guess this makes it Desi Italian! This is a wonderful dinner and you can always skip the bread and just eat the veggies..they are so delicious!! I almost ate all my zucchini before it came out to the table! Reposting this recipe for the 'Show Me Your Sandwich' event hosted by Divya Vikram of Dil Se..
My daughter's school work - her teachers asked her to draw 3 puppets - Apple Auntie, Looney Lion and Jolly Jogger. Here they are from her imagination! Looks like Apple Auntie is bald - looney lion does look looney - and Jolly Jogger looks thin from all the jogging!! Haha! I love chocolate. My husband does not. I love cakes. My husband does not. I love chocolate cakes. My husband does not. So, it kind of became difficult for me to bake something for him for his birthday. So, I gave him an option - it will be chocolate (I have to eat the cake too!) but I was more than ready to add a layer of whatever he picks!! See what a good wife I was being! He picked Lemon! Not my favorite - but hey - its his birthday - he gets to have a layer of whatever he wants! So, I decided to bake a lemon and chocolate layer cake. With pecans! After some research, I baked a chocolate sheet cake and a lemon sheet cake. I used the same recipe of the chocolate sheet cake - minus the cocoa, add some lemon zest and fresh lemon juice to it - and voila! lemon sheet cake. I made some chocolate icing and another batch of the same without the cocoa, add lemon zest and lemon juice and voila - lemon icing. I added chopped pecans to the icing for that nutty taste! I cut the sheet cakes into halves, applied the icing to all four layers. And assembled them one on top of the other. Applied the remaining icing all around the cake! There it was - it does not look perfect - but that was my first attempt at layer cakes. The lemon icing on the top was a little strong all by itself but eating the whole cake as a piece worked well. Happy Birthday Hubby and hopefully by next year, you will start eating chocolate cakes!! Sunday afternoon Lunch - quick and easy Cauliflower Kurma and Ghee Rice. This used to be a staple when my sister and I were kids at home. My mom and paati would make Masala Dosa, Chutney and kutty onion sambar. We would stuff ourselves with that and in a couple of hours, it would be lunch time. It was always Cauliflower Kurma and Pulav - but the pulav was never with lots of masala - it was more of a simple but awesome Ghee rice. Today - I wanted to make that for lunch - missing mom and paati and Dad- wish they were here with me!! But here's my quick fix. Before you start anything - soak about a tbsp of raw cashewnuts with white poppy seeds (about a tsp) in water. 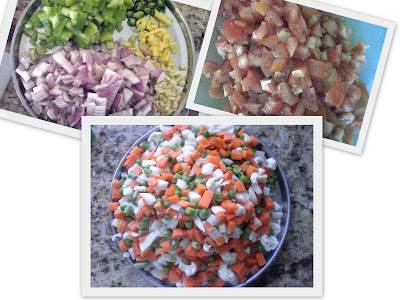 Cut Onions, Tomatoes (large pieces), green chillies, ginger, garlic and coconut (frozen is fine). I had fresh coconut and hence decided to use that. Cut Cauliflower into medium sized florets. Grind together coconut, green chillies, ginger, a bit of jeera and coriander seeds and the soaked cashews and poppy seeds. Heat up a pan, add about a tbsp of oil, add the cut garlic (my mom never used garlic btw) and fry till brown. Add the onions and fry for a min. Add tomatoes and fry for a couple of mins. Add the cauliflower and mix together well. At this point, add tumeric and salt and a little bit of red chilli powder. Fry this well till just for a couple of mins. Don't cook this too much or else the cauliflower will become too soft and soggy. Add the ground paste to this and add maybe a cup of water to the pan. Let it cook on simmer for like 5 mins till the raw smell of the paste goes away. You are almost done. Just add fresh cut cilantro leaves to this and you are done! This kurma is full of flavor because of the poppy seeds. Even though this is a gravy, the cauliflower is still crisp because we fried it before we added the water. Enjoy this hot! Now, for the rice - this is a super easy quick recipe. I cooked the whole thing in the rice cooker. Add a couple of tsp's of ghee to the rice cooker and switch on the cook button. Add about 3 bay leaves, 3 cloves, and a piece of cinnamon. Add the onions and fry it in the rice cooker till translucent. Add the washed rice - 2 cups of basmati rice. Add about a cup of mixed veggies - carrots, beans and green peas to this rice. Fry all of this together without adding water for a min. Add salt to the rice at this point. Now, add the water - I added about 3 cups of water for 2 cups of rice. Close the rice cooker and let it cook. You are done. When you take out the rice, make sure you don't mix it up hard. That will break the rice and mash it up. Just take it out gently and serve in another bowl. Remember, this rice has no masala and is not spicy at all. 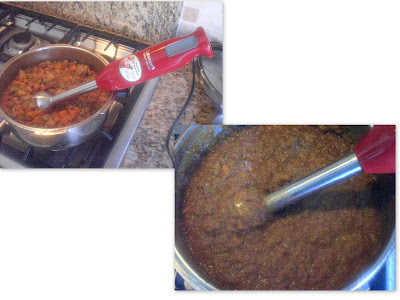 All the flavor comes from the ghee and the bay leaves, cloves up that we added upfront. This is a perfect rice for kids. Now, sit back and enjoy this simple meal. I savored every bite of this ...we would watch Ramayanam and He-Man, the master of the Universe while eating this meal at home. Today, we watched my daughter's favorite cartoon while eating lunch! Its almost the end of winter and beginning of spring. We have a couple of beautiful walking trails near our house and today being one of the warmer winter days, my family decided that we could go out for a nice long walk. We started to walk and I told her that once we reach the start of the trail, she can start looking for interesting things to collect. And to save myself, I told her that she needs to cycle atleast a few mins in between collecting her things. We had a blast - it was a good fun family exercise. I got my workout - I had to jog to keep up with her cycling. My husband was behind her running..what a workout! But we did end up collecting a lot of beautiful flowers. I told her that she could have only one flower in each type so that she leaves enough flowers for the bees to pollenate..!! yeah - 4yr olds are sold on realistic stories like these. And having watched the Bee Movie a few times, she understands the importance of the bees pollenating! This little red flower was her favorite. Her reaction on seeing this flower was like someone winning the jackpot. As soon as we came home, she pulled out her Dora Shoe Box and put all her treasures in them. She now wants to take this to school tomorrow to show her teachers and friends. After sometime, she gave us the most wonderful thank you and told us that this was the best treasure hunt adventure she ever went on and gave us a great big hug for it. Simple Pleasures. We stopped and smelled the roses today. What about you? I've always loved Thanjavur Paintings - who does'nt? When we bought our house, I wanted to setup a nice puja room. I wanted to hang pictures of gods painted using the thanjavur painting technique. We all just look at the end product and admire its beauty. But, there is so much effort behind it that goes unseen. This time when I went to India, my mom found this person who teaches tanjore painting classes in Salem. He and his people also make custom painting by order. My sister and I gave him our orders. She had ordered about 12 pics - all different gods. I ordered like a big frame with about 6 gods in there. I wanted a wooden temple like frame around it so that I can just hang it on my wall and that would be my puja room at home. I wanted Uppliappan Perumal in the middle since he was our Kula deivam. Got Guruvayoor Krishnan to his left and Ramar Pattabhishekam to the right. Rama Pattibishekam has all the 4 brother, Ram, Sita and Hanuman. Then at the bottom, I wanted Ganapathi, Lakshmi and Saraswathi. I gave the order and just hoped it looked beautiful. In between I visited the artists house to see how the painting was going. He did inform me that it was a big task and they need time to make it beautiful because it is a lot of detail work. I was in no hurry and told him to take his time. Here's how it looked at that time. They were just beginning to work. They worked so hard on my picture to make it perfect. Last week my mom told me that the picture was complete and they bought it home. Its' just beautiful. Thank you to my artists. Your work is beautiful. It seems that a lot of people have now visited my mom's place to just see this piece. My mom is now working hard to courier this to me. She is figuring out a good packaging agent to pack this nicely to ship it to the US. Fortunately, they did not use glass on top. Since this was an order to be shipped abroad, the artist told me that they would use a kind of acrylic sheet that just looks like glass but does not break like one. So, I'm hoping shipping this would not harm the painiting. I'm so waiting for this to reach me. Once its here, I'm planning to break a few shelves on my walk-in pantry and convert that to a puja room on one side. Will update you all when I get the picture and complete my project. Well..the translation for this topic is - Here comes the flower lady! When I grew up in Salem, we always had door service. Veggies were delivered in the morning by a lady. A guy used to bring fresh milk to the house in his bicycle. Flowers were delivered every evening - malli poo, jadi poo, oosi malli, gundu malli...etc. I miss all those things now. As soon as she's near our house, she screams - "Amma, poo ma" And then someone inside our house would scream "Poo Kari Vandhitta..". My mom would go out and buy flowers from her. This time when I went to India, I happened to have my camera in my hand when our poo kari came. So, I got a couple of quick pictures - she was just elated to have posed for me!! I made her day! I wish my poo kari would come and give me flowers like this everyday in the US. I wish my dhobi will come and iron my clothes everyday.....but for now, I'll keep dreaming! I'm going green...well..atleat my rice is. Today my mission in life is to serve a nice plate of Pudina Rice for dinner. Simple Goals People! This rice might look a little too green - for some of you who dont like green food that much, don't shy away - this tastes so gooooodd..its so full of flavor ...you don't even need an aftermint! LOL! enough of my stupid jokes - let's get started. Keep Rice cooked and ready to go. Fry everything other than Fresh Mint and Coconut in a pan. Once this stuff is a little done, add the fresh mint leaves in and saute for a min. When all the little leaves curl up, add the coconut and fry everything together for a couple of mins. Switch off the stove and let this cool for like 5 mins. Grind them in a mixie or blender and keep it ready. Saute the Onions in about a tbsp of oil. When the onions become translucent, add the ground mint paste and fry for a couple of mins. Add the cooked rice little by little and mix well so that the paste coats all the rice completely. Done! My mission accomplished! Enjoy this hot. I had some leftover Kurma from yesterday and used that as a side dish for this. You could make a nice onion raitha if you really want something to go with this. It tastes good just by itself.